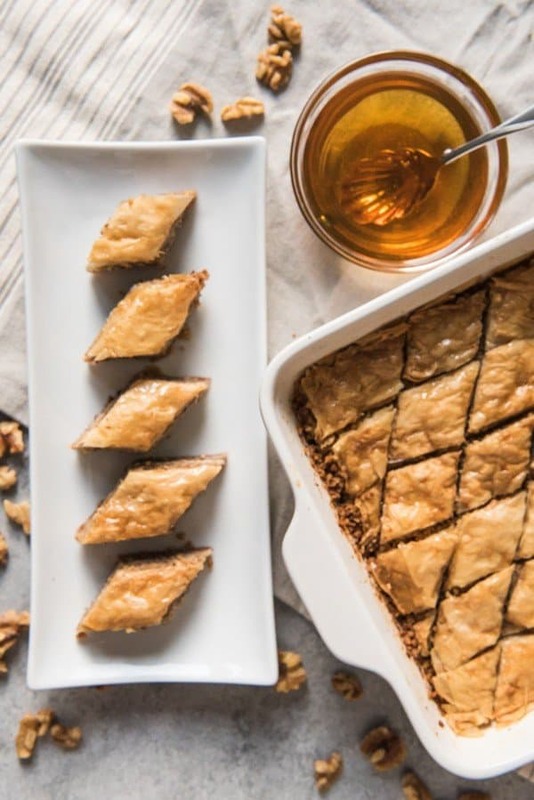 This Greek Baklava recipe has walnuts and cinnamon layered between flaky phyllo dough brushed with melted butter then baked and drizzled with a sugar and honey syrup to create a crispy, sweet, and impressive dessert! Years ago a friend mentioned to me that one of her favorite Christmas traditions was making homemade baklava. Ever since then I have wanted to try it myself, and this year I finally did. And now I’m wondering what took me so long! Although there are a few steps to assembling the baklava, none of it is difficult! And it only takes trying it once to realize just how easy it is to make truly fantastic baklava at home! I’m a HUGE baklava fan. I mean, nuts and honey and flaky pastry? But I can’t remember ever trying it until we went to Greece and Turkey after graduating law school. And ever since then it has been one of my favorite treats that I tend to have cravings for. Some people crave donuts or cupcakes. I crave baklava. Greek food just wasn’t something my family did when I was growing up mostly in Nebraska and southern California. My only experience with it was some vague notion that it was mentioned by Genie in the Disney movie “Aladdin”. It turns out there are many variations of baklava, depending on where it is from in the Mediterranean or Middle-East. 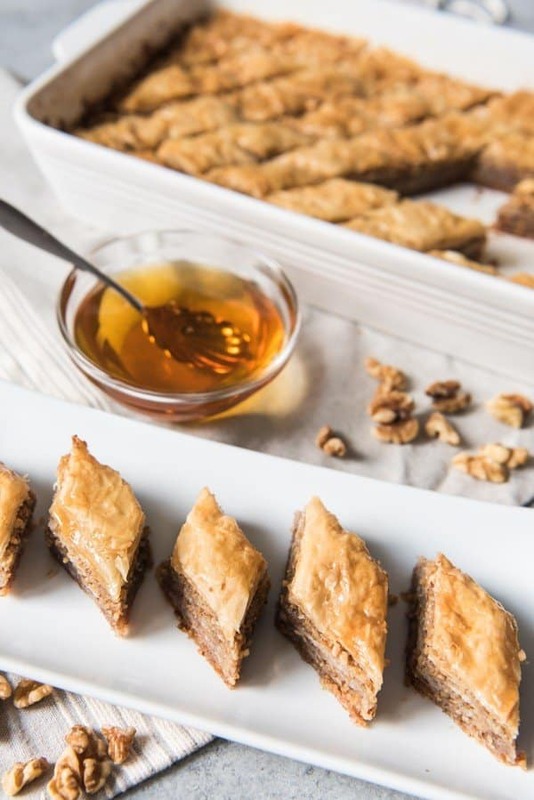 Some baklava is sweeter, some more heavily spiced with cloves and cardamom in addition to the cinnamon or perfumed with orange blossom or rose water, and the nut-filling used in baklava is different from country-to-country. The way baklava is assembled or even sliced also gives clues to its origins with diamonds, triangles, rectangles, and squares being the most common shapes, although I have also seen circles, cups, and “cigars” – little rolled up tubes of baklava. I’m certainly no expert, but I can google and I did quite a bit of research when I was trying to decide what kind of baklava to make. 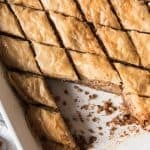 There seems to be a dispute about who really invented modern baklava, with the Greeks and the Turks making the strongest claims. Supposedly, baklava was a favorite of the Sultan at Topkapi Palace in Istanbul. But it was the Greeks who invented the phyllo (or filo) dough that is used in baklava today. 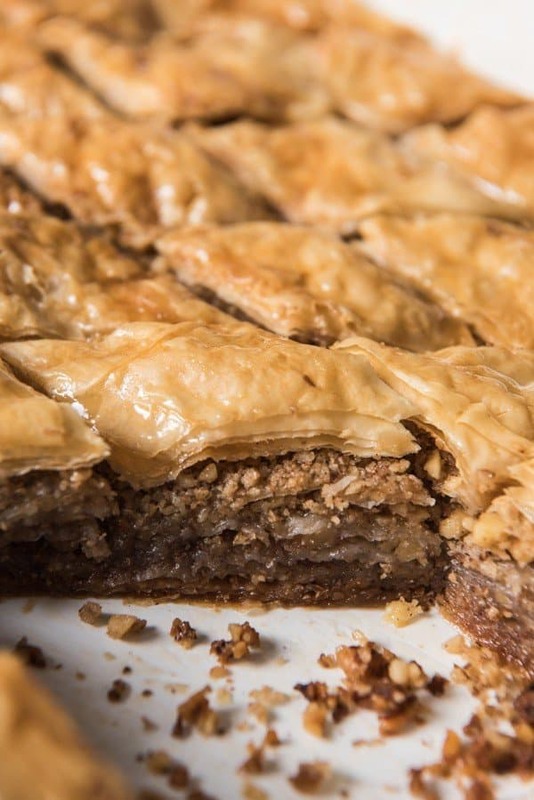 But many other countries like Lebanon, Iran from the Middle-East, and even Hungary in Europe have baklava traditions that stretch bake centuries. 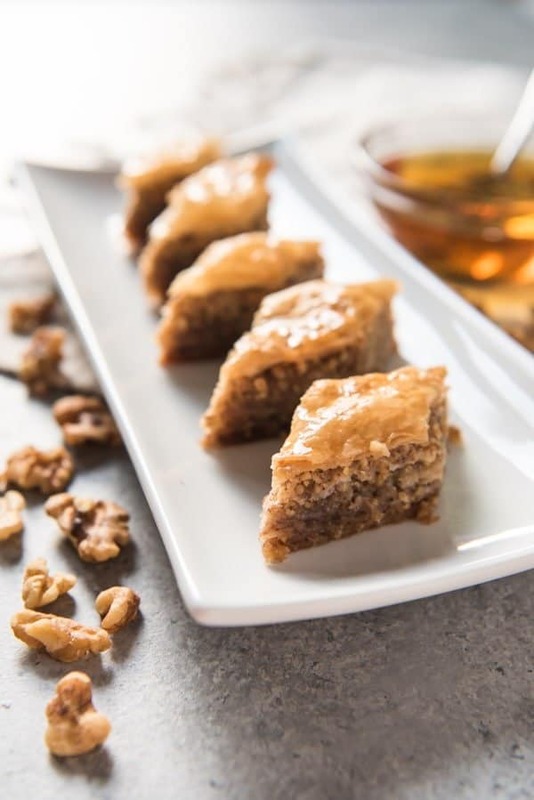 Greek baklava appears to predominantly use walnuts as the nut of choice for the filling, with honey being another major player in their baklava recipes. Pistachios or a mix of pistachios and almonds are more often associated with countries like Turkey, Iran, Lebanon, and Azerbaijan. And supposedly there are strong feelings held by many Turks that honey doesn’t belong in baklava. Less traditional baklava like that found in Hungary uses an apricot filling. I even saw some baklava recipes calling for chocolate chips, which I knew wasn’t what I wanted to make for my first attempt at baklava. 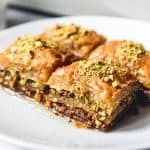 I knew that I wanted to go with a Greek approach since my favorite baklava always has a strong honey flavor to it, even though I also really love pistachio baklava. I found an easy and straightforward-looking recipe on another blog I love called Natasha’s Kitchen. I’ve made a few of her recipes before and they have turned out well. Plus, her approach looked simple enough. While she doesn’t describe her version as Greek baklava, the walnut and cinnamon filling with a honey syrup and diamond-shaped baklava slices all seemed to indicate a Greek origin to me. And oh my goodness, this baklava did not disappoint! It makes a huge pan that is great for sharing. 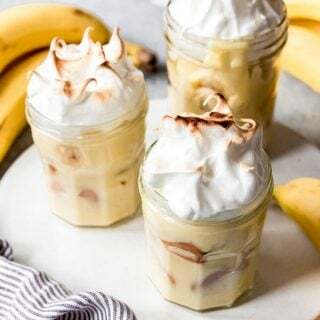 The flavor was absolutely incredible with just the right balance of sweetness and warmth and butteriness from all the honey, cinnamon, butter, and walnuts, with that little bit of lemon juice to offset the other flavors. Plus, it was so much easier than I thought it would be! I can’t believe it took me so long to try making baklava at home! Yes, the instructions might look intimidating and long, but really, it’s just making a super simple and quick syrup, then layering a package of thawed phyllo dough with butter and chopped nuts, then baking it! The biggest issue I had was a lack of information on actually working with phyllo dough. Specifically, I didn’t realize that while most frozen phyllo dough is sold in 16 ounce packages, some include only 1 large roll of phyllo dough with 18-20 sheets while others contain 2 smaller rolls totaling 40 sheets. It’s not a big deal though. If you buy the larger sheets, just cut them in half and you are good to go. The important thing is knowing that you are going to need 36-40 sheets of dough that is trimmed to the size of a 9×13-inch baking dish. I also found that despite keeping a damp towel over my phyllo dough, some of it still seemed to want to crack and tear. It’s super thin stuff and I ended up sort of piecing together a few layers of my baklava with broken and torn scraps of dough, hoping it would turn out okay. And it totally did. So if you feel like you are struggling, don’t get frustrated. 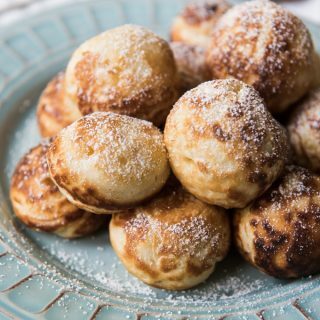 By the time everything gets layered together, baked, then drenched in syrup, nobody is going to have a clue about less than perfect sheets of dough with wrinkles or tears or whatever. 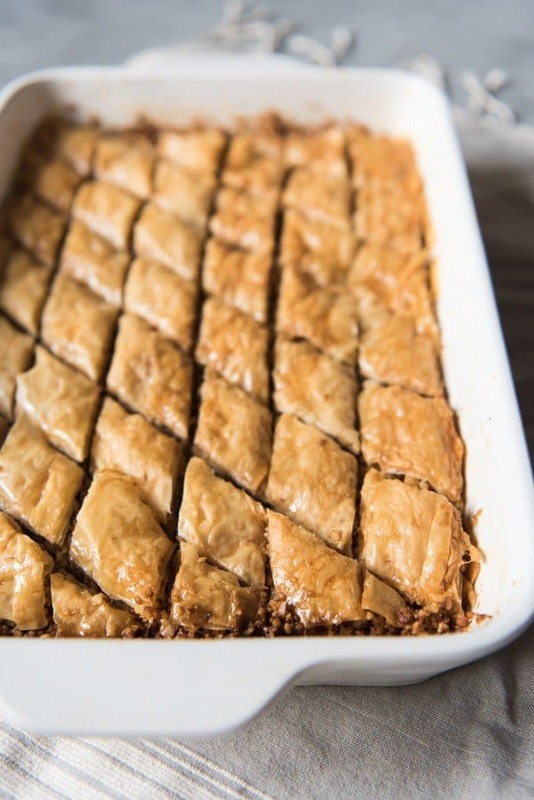 Finally, be sure that you make the syrup BEFORE baking the baklava so that it has plenty of time to cool completely prior to the baked baklava coming out of the oven. It’s important to pour cooled syrup over hot baklava, otherwise it won’t be absorbed properly and you will end up with soggy baklava, which is not what you want. I really, sincerely hope you feel the same way about baklava as I do. 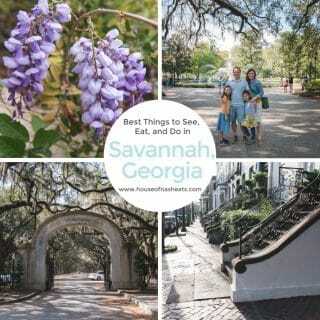 Or if you haven’t had it before, that you give it a try! Thaw phyllo dough completely by placing it in the fridge overnight, then letting the package of phyllo sit, unopened, on the counter for 1 hour prior to making your baklava so it can come all the way to room temperature. Butter the bottom and sides of a large rectangular 9x13-inch baking dish. Trim phyllo to fit in the dish, if necessary. I have seen 16 oz. pkgs. of phyllo that come with either 18 large sheets in one roll or 40 smaller sheets in 2 rolls. Either works, so long as you have 16 oz. of phyllo. I just cut the 18 large sheets in half down the middle to fit, giving 36 sheets. The 40 smaller sheets might just need to be trimmed slightly around the edges. Keep trimmed dough covered in a damp cloth so it doesn't dry out. Chop walnuts in a food processor by pulsing 10-12 times until coarsely ground or chop with a knife until very finely chopped. Stir together the walnuts and cinnamon until combined. Prepare the sauce before assembling the baklava so it has plenty of time to cool completely before pouring over the baked phyllo dough. 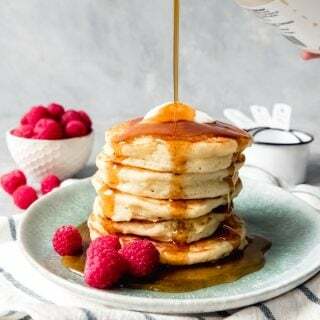 Combine the sugar, water, honey, and lemon juice in a medium saucepan and bring to a boil over medium-high heat, stirring until the sugar dissolves. Reduce heat to medium-low and continue to boil for 4 minutes more without stirring. Remove from heat and cool completely. Sprinkle approximately 1/5 of the chopped walnuts and cinnamon (roughly 3/4 cup) in a thin, even layer over the first 10 sheets of phyllo dough. 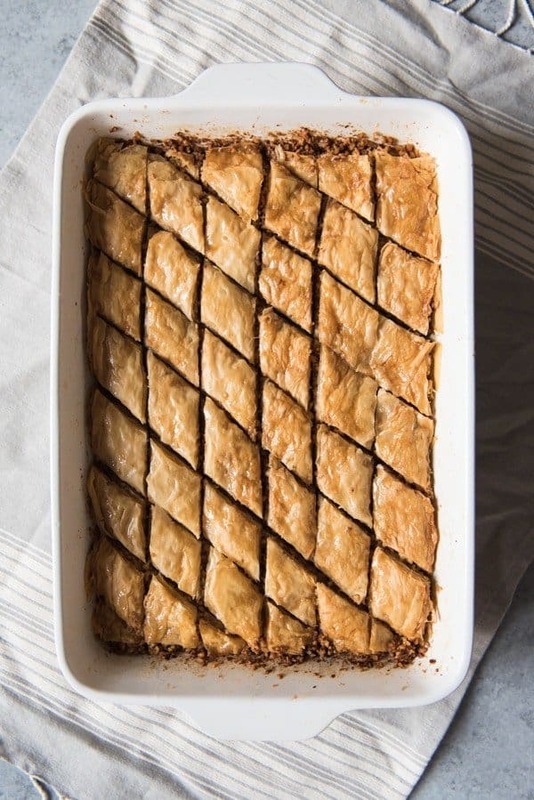 Repeat 4 more times but with 5 sheets of phyllo dough instead of 10, brushing each with between before adding the next sheet and sprinkling with 3/4 cup of the chopped walnut mixture between each layer of 5 sheets of buttered phyllo dough. Finish the baklava with a final, top layer of phyllo dough brushed with butter between the layers using the remaining 6-10 sheets of dough. Brush the top sheet of phyllo dough with butter as well. 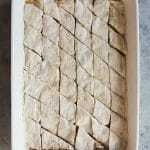 Carefully slice the baklava into 1 1/2-inch wide strips lengthwise, then slice diagonally to create diamond-shaped baklava. Or just slice squares if you prefer. Bake in the 325 degree F oven for 1 hour and 15 minutes, until the baklava is golden brown. Remove from oven and immediately drizzle all of the cooled syrup over the baklava. Let the baklava cool completely at room temperature for 4-6 hours without being covered so the baked pastry can soak up all of the syrup. The finished baklava can be store for 1 to 2 weeks at room temperature, covered with just a clean tea towel. Recipe originally from Natasha's Kitchen with slight modifications to instructions. 10 phyllo sheets, brushed with butter between each sheet and on top of the final sheet. Be sure to check out the other amazing recipes shared by some of my food blogging friends who are also participating in Cookie Week! Baklava is one of my favorite things! I haven’t made it in ages but this is making me want to make it again soon! I love baklava! It’s definitely a holiday treat with the nuts & honey. I’d love mine with a bit of ice cream, though a tad non-traditional. I also like how you provided some background on the Mediterranean region! Yum! I love Baklava and it is nice to learn there are different types. I am excited to try this Greek version with the honey and walnuts! Also Georgia has a variation of Baklava dessert. It’s very similar but made with a bit different dough (at least the one I tried). It’s called very similarly, Pakhlava. That’s so interesting! I didn’t see anything about a Georgian variation but I’m going to have to look it up now! This is amazing…so informational and gorgeous photos. Love this. I haven’t had Baklava in so long, and was more of a Middle Eastern version. Super impressive! phyllo dough has always been my nemesis. Thanks for the great tips! Love baklava….this would be dangerous to have around the house. It is definitely dangerous for me to have around! But it’s perfect for sharing with friends! I always use salted butter, but it would be fine with unsalted too. I honestly don’t think you would notice a difference with this particular recipe. 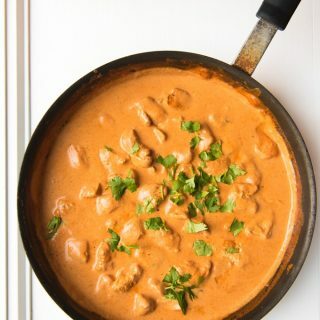 Love this recipe, trying it tonight. 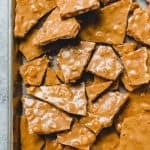 Do you think I could subsitute agave for the honey or would it destroy this recipe? Thanks! Honestly, I’ve never used agave! But if you try the substitution, please let me know! The you for the recipe. Just made it yesterday and it turned out incredible !!! For the syrup, I substituted Truvia for the sugar and used honey brought back from Greece 🇬🇷. Wish I could attach a photo here if it. Thanks again Amy !!!! P.S. My next dessert will be Spanakopita !!! Honey from Greece? Swoon! Now THAT is true dedication to baklava! 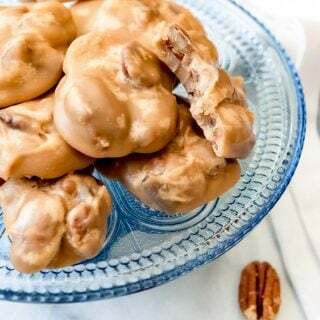 what do you think of using pecans in addition to other nuts? do you use black walnuts or english? how about meyer lemons as sub for regular lemon? You could absolutely use pecans. Pretty much any mix of nuts will work. I think mine are english walnuts. As for the meyer lemon question, I’m really not sure – I haven’t actually cooked with meyer lemons! one last thought on variations, what do you think of using puff pastry as the top layer? Puff pastry is too thick and bread-ish for traditional baklava. I’m not saying it would be bad, it just would change the recipe quite a lot and I haven’t tried anything like that. 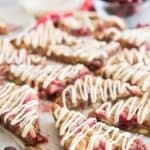 This is the best recipe I’ve found! I added pistachios to the walnuts, added a couple more layers, and per a suggestion from a friend, added more honey. I also put a few whole cloves in the syrup while boiling. Thank you for the “basic”!!! You are welcome! I love that you are making this your own! I am going to have to try the whole cloves thing! Do you use a cake pan or a cookie sheet? I always use a 9×13-inch baking dish. It’s the same one I use for casserole, not a half sheet baking pan like I use for cookies. 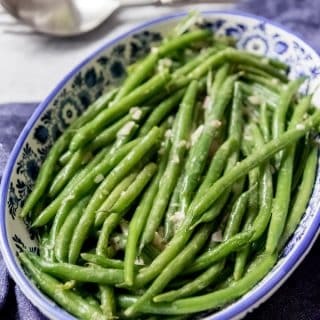 Would this recipe work well halved, which size pan would you reccomend if making half the recipe? You could certainly halve the recipe. 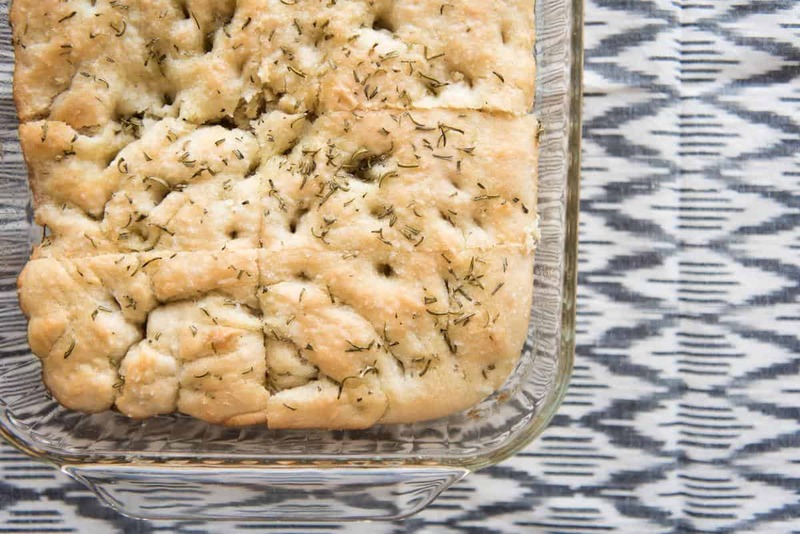 I would use a square 8×8-inch baking dish. 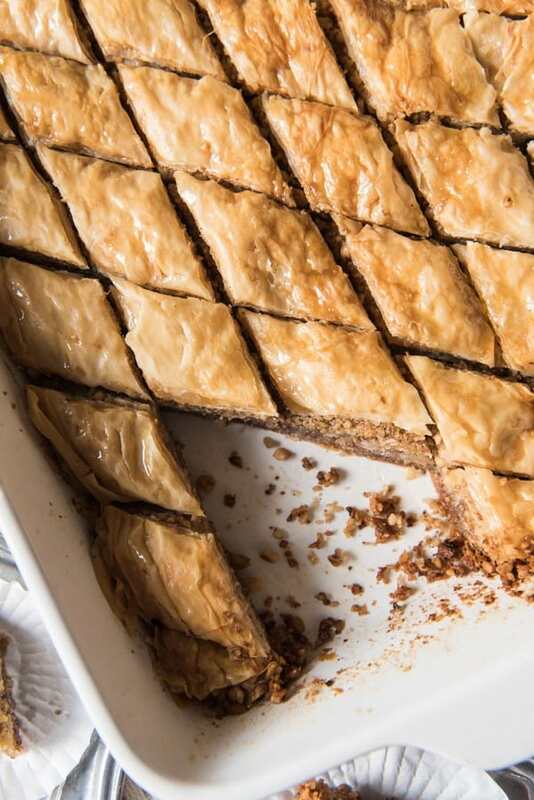 I always come back to this recipe for baklava. I’ve traveled abroad & tasted several versions including the Hungarian one but this one is best to me. My friends in Croatia like me to add very thin slices of lemon on top before baking. Me? I’m a purist. I’d lost the original link to the first recipe. Thanks for this one. Tried this after tasting some at a fundraiser. I used this same recipe. I think I cooked it a bit too long so maybe try an hour and 5 min. My oven runs a little hot so maybe the temp was too high. I think next time I will also ground the nuts a bit finer. It was totally a hit at my house this Christmas and I will definitely make it a tradition. Wow! WOW WOW WOW! This was so good, I can’t believe how well it turned out, it tastes amazing, I could not recommend this anymore. Thank you!